“Sometimes what makes a design brilliant is its simplicity. The second design of my Lover's Knot collection, Thistle Field, has been released. I was very happy with it ... until I blocked it and saw the finished result. I only failed to consider one thing: the laws of physics! :) The airy lace of Solomon Knots was not able to hold its shape because of the weight of horizontally placed pattern repeats. Each new horizontal stripe added more weight and distorted the look of the upper stripe. 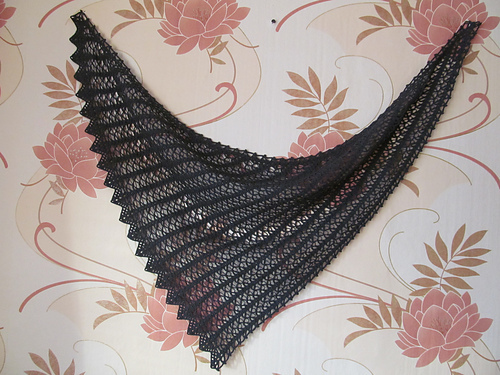 "Ha-ha", I thought at the time and, since things like this happen, I frogged the shawl and completely forgot about it until the following autumn. A few months later, between working on various projects, I suddenly came up with a great idea! 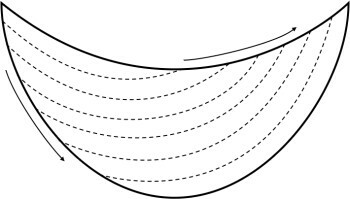 What about designing a crescent-shaped shawl, which would copy the Lavender Path path stitch pattern, but this time with horizontally arranged stitch pattern stripes. Yay! The shape was still crescent and the stitch pattern was still horizontal, but this time I changed the location of decreases. 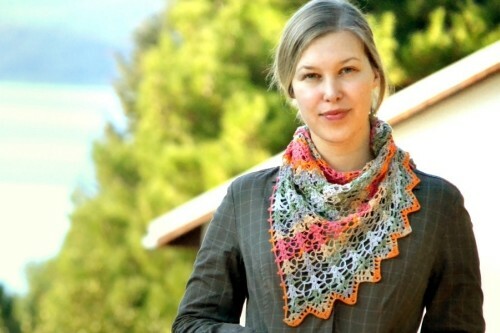 The construction of the first sample was standard: straight neckline with increases placed along the bottom of the shawl. 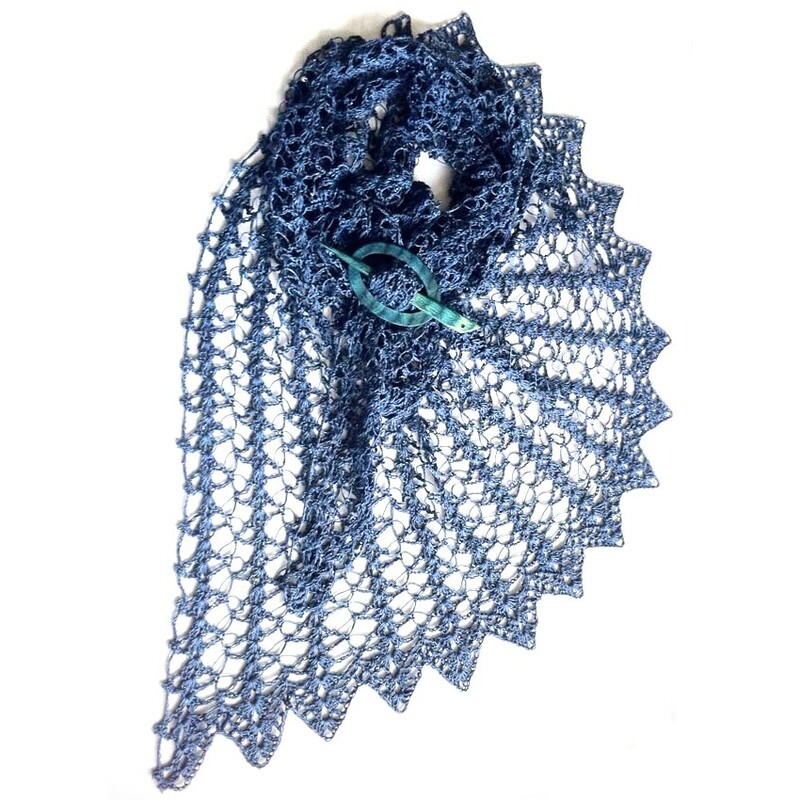 In the second sample I decided to keep the first half of the shawl unchanged, but to move the decreases to the neckline in the second half, creating a lovely swirl of the stitch pattern stripes. There was only one problem: I couldn't keep the second half as neat as the first half. It looked ugly: straight, then down, like a gull wing. I did a lot of trials, changing the stitch pattern and ripping back the second half. None of my attempts worked while the first half of the shawl remained beautiful, neat, and easy to make. And then I remembered one of the cleverest design mottoes (IMHO, of course:): "keep it simple". If the design has "details", which do not work and can be removed, remove them! In this case this "detail" was the whole of the second half of the shawl. So I got rid of it! Voila! I present to you an asymmetrical triangular kerchief with an edging along one side! Easy, beautiful, edgy and, most importantly, my little gravity problem was solved. 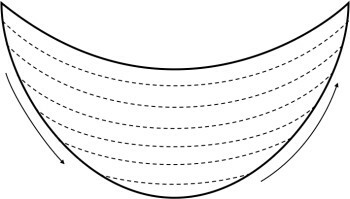 The stitch pattern stripes, which are now placed diagonally, do not break the lace stitch pattern with their weight.